For the feast of St Nicholas, here is an unusual representation of the saint. 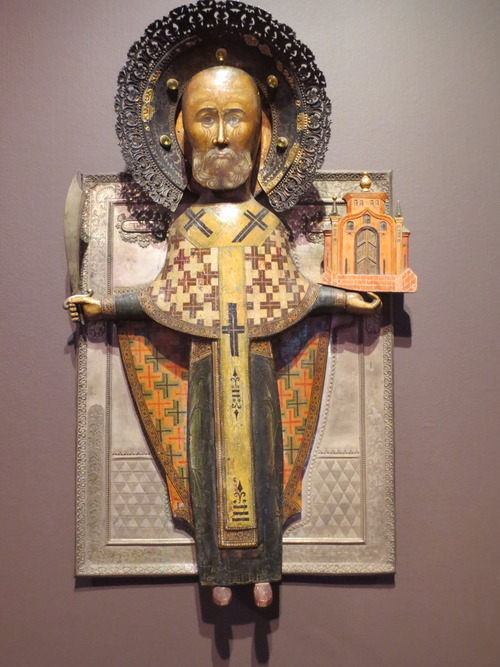 It comes from the Museum of Russian Icons in Clinton, Massachusetts. It is not generally part of the iconographic tradition to have sculpture, although relief carving is common. I am told that statues are not banned in Eastern churches, but it is not part of the tradition. This makes sense to me. The iconographic tradition seeks to portray man partaking of the divine nature in union with God. In accordance with this, icon painters seek to destroy the illusion of depth in icons to represent the heavenly realm which is outside time and space. Sculpture by its nature is three-dimensional so would undermine this convention. Relief carving, is common, however, this is really creating a two-dimensional image in shadow rather than creating three dimensional images; and so is consistent with the iconographic prototype. At the Museum of Russian Icons they have a large collection of Russian St Nicholas statuettes. I am always intrigued by these. They are not fully three-dimensional, but neither are they as flat as a relief carving. They remind me of early gothic sculpture in their degree of three dimensionality and because they are polychrome. I have explanation as to why these statues were made. Or why it only seems to be in connection with certain saints. St Nicholas is one and at the museum they have a lot of similar statues of another Saint Nil, but only these two. Russian icon style contrasted with Greek My icon painting class recently made a trip to the Russian Icon museum in Clinton, Massachussetts (perhaps 1 hour west of downtown Boston). Certainly, this is the best collection that I have ever seen (I have not been to Russia or Greece). It is only recently established (2006) and displays the private collection of Massachusetts industrialist, Gordon Lankton. The collection includes more than 400 Russian icons and is one of the largest private collections outside Russia. What is particularly exciting for me whenever I go to the museum is the chance to see a number of very large icons from one of the glorious periods of Russian icon painting in the 16th century. I shall talk about some examples from the museum in describing the Russian style.I shall talk about some examples from the museum in describing the Russian style. The one that that I love is the Christ in Majesty which dates from 1580 and is about 5ft high (if you click the image on the right, it will enlarge).This is one of the Christ- 'Pantocrator' images, which means all powerful or omnipotent. Sitting on a carved throne he blesses with this right hand. He is surrounded by the oval mandorla and two curved squares forming an octagonal star. The Mandorla represents heaven and so with it Christ is placed outside the earthly realm of existence. The octagon represents the 'eighth day' of Creation, by which Christ instituted the new order. In the corners of one square are the four Evangelists taking the gospel to the four corners of the world. The cherubim around the throne, contained by the mandorla, and which represents the world's angels . These are rendered in monochrome (indigo, vermillion or green) by elegant tonal work in black and white over the base colour. In some icons, the Russian style can appear simple at first glance. The figures are less modeled than, for example, the Greek or Byzantine style (the 14th century Annunciation shown left is in the Greek style). The Russian icons describe rely far more on line to describe form. The 'colouring in', is done by using multiple washes of transparent paint, rather like watercolor washes. The variations of color and tone that result are subtle. This is apparent in, for example, the icon of St Nicholas shown, below right, which dates from 1525. Images below: the modern replica of Rublev's Trinity; a Greek Annunciation, 14th century (this one is not in the musuem it is shown for comparison).